It is so easy to get a credit card today, with limited credit worthiness, low credit ratings and sometimes even with bad credit. You would almost think that these sales people are selling credit cards are on a commission. They seem to get paid by the number of new customers they sign up. This occurs regardless of the client and their ability to pay the balance at the end of the month. As consumers we get pre-approved credit card applications in the mail every week. At stores and banks we are offered credit card applications. We can usually be approved on the spot. We once purchased new appliances, were asked if we wanted to take out a credit card to pay for them. As an incentive, they offered $100 off the price of the purchased items. We obviously said yes and were approved within a few minutes, no questions asked. They did not tell us that the interest rate on unpaid balances were 29%. But it did not matter to us. We had the money to purchase the appliances in the first place. We just paid it off when the monthly statement arrived. With all of these credit card products available it can be tempting. It can be actually fairly easy to end up with many credit cards. What consumers may not realize is that having all of these cards actually means you can incur a great deal of debt. The credit rating agencies will lower your rating correspondingly because of your exposure whether you use them or not. Next time you apply for a loan or a mortgage for example, there is a chance you could be turned down due to a poor credit rating which comes as a surprise to many people. If you have a lot of credit cards due to various reasons, you may want to close the accounts to protect your credit rating. It could take up to a year for the credit card to come off of your credit report. So take this into account if you are applying for a mortgage or a loan of some kind in the future. 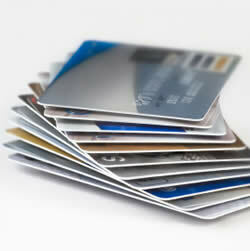 For more details about credit cards, click here.